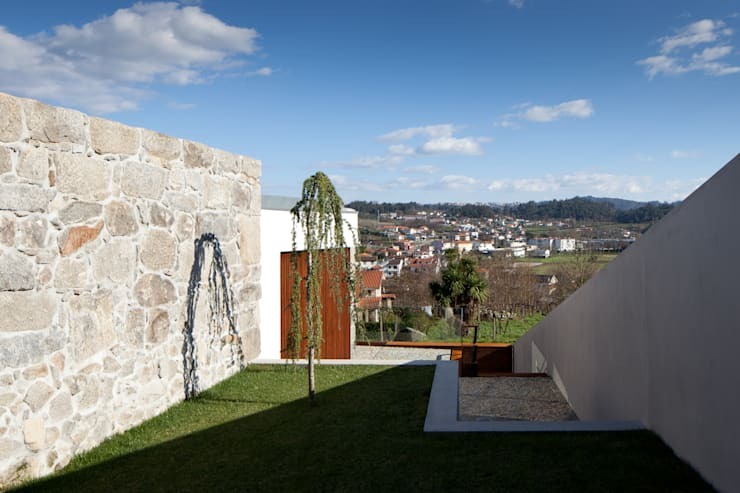 In the area of Felgueiras, Portugal, FCC Architects have taken a rustic ruin and transformed it into a modern home which has retained the best of its historical elements. When commissioned with this project, the architects found this quaint farmhouse in an advanced state of degradation. The entire interior of the house was in complete ruins. It was decided that the core of the house will be completely demolished and the roof removed. Then 'new' house was then designed and built within the boundaries of outer structure, which had been recovered and consolidated. The result is a beautifully nostalgic home that offers a completely modern interior. Join us for a look at the different aspects of this exciting project. The exterior structure of this historic farmhouse is really the star of the show. As we can see here, the boxed building is constructed mainly by natural stone. This was the original building material and it had been restored to maintain its rustic beauty. In addition to recovering the original structure, the architects have added glass and rusted metal to complement the earthy exterior. The rusted gates and doors are darkly coloured to play off the lighter coloured stones, and the glass used in windows and as bannisters provide a modern twist without being imposing. At the back of the main building, we can see a modern extension peeking out from behind the stone façade. This is also a subtle addition which allows for expansion whilst not endangering the rustic aesthetic. From the street view we can see the contemporary side of the house from a better angle. 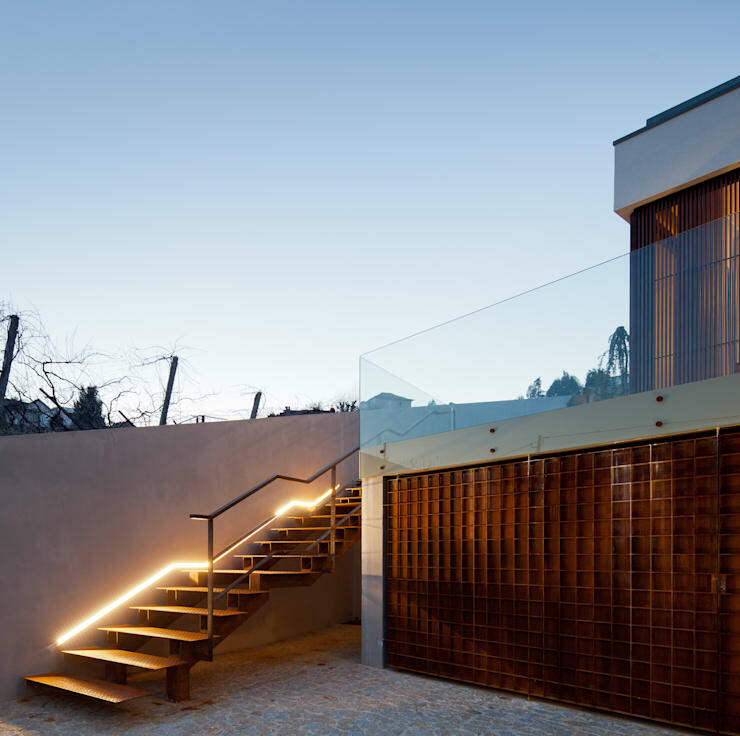 This modern addition to the house is in a bold, minimalist style to keep the focus on the main façade. It is a rectangular structure with concrete walls. This part of the structure is painted white which is at once not too imposing to the stone structure and earth, but also provides a gentle modern contrast to the historic part of the building. Walking along the street here we can also see a bed of indigenous plants along a slope which would have otherwise have been just dead space. 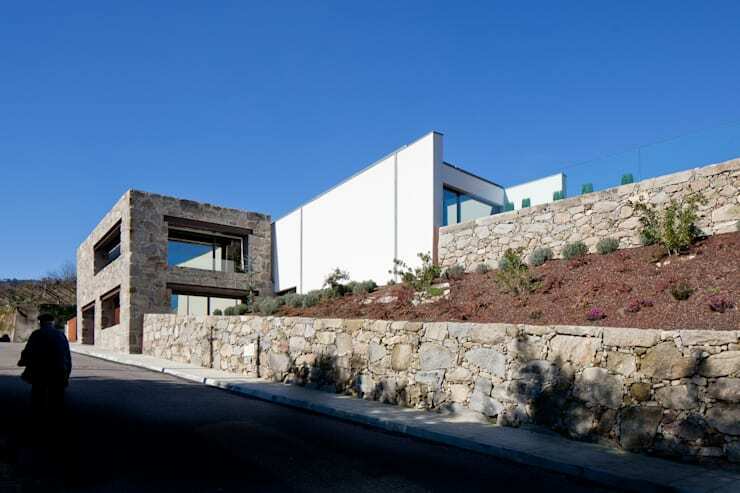 In this gesture we can see a commitment on the part of the designer to respecting the environment where the house is situated. This is well-suited to the preservation of the man-made structure as well. Moving around from the balcony of the house we find a rusted metal stairway leading down to a small courtyard or driveway. The rust colour of the stairs adds directly to the rustic character of the entire project with a lovely pseudo-degraded charm. There is innovative light fixture running alongside the stair treads for illumination, but which is also charming in its colour and character. On the ground we can see the entrance to the garage, which is also covered by a rusted iron gate with a grid detail. The use of this material provides an interesting texture which is played off against the glass banister of the balcony above, as well as the concrete of the structure and the stone pavement. A brief trip inside on the house reveals much of the style used throughout the interior of the home. 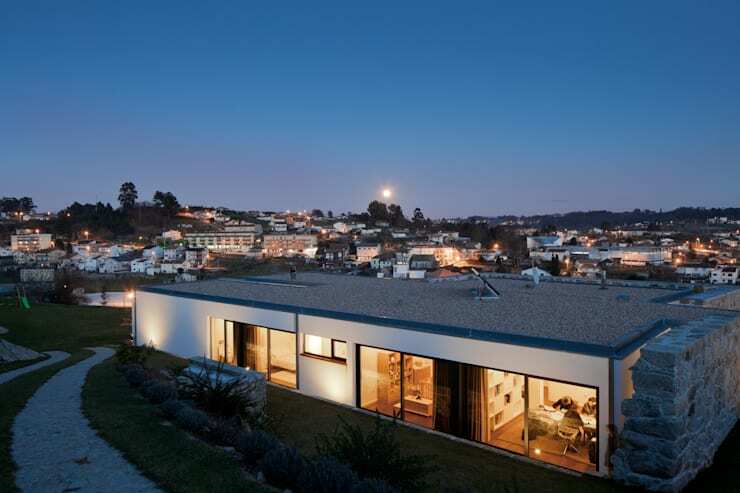 What is apparent here is a clear minimalist style with contributed indisputably to the modern character of the home. The flooring used in this space is wooden laminate, which ensures the beautiful characteristic of wooden floor boards without subscribing to high expenses and assured maintenance. The blinds are neutral-coloured and simple in order to keep to the minimalist aesthetic of the interior. Behind it we can see a small cubic courtyard filled with stones and backed by a mirrored pane. 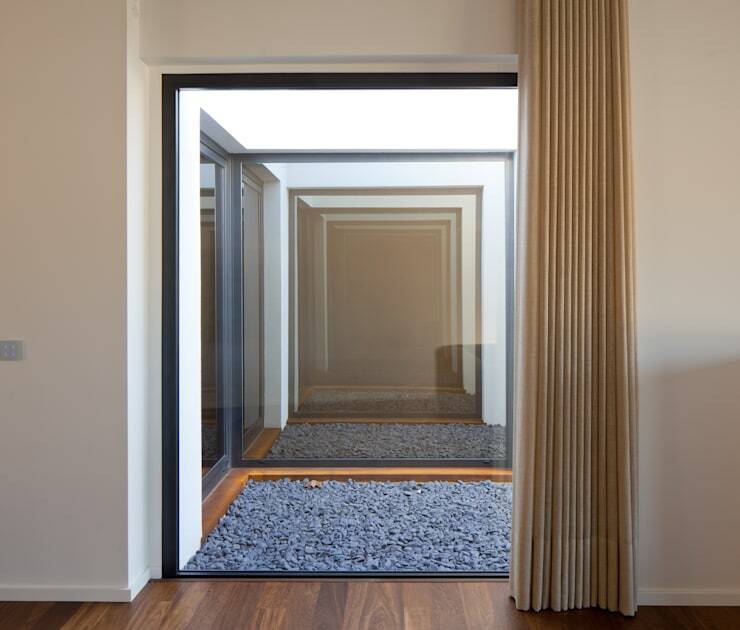 This creates the illusion of infinite space, and adds endless depth to this specific room. Walking through the home we get a good indication of the types of materials used and to what effect. 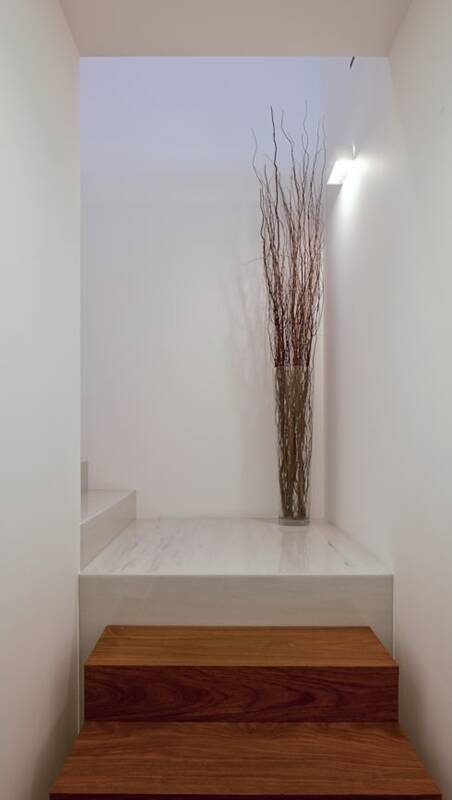 Here in the stairway we see a lovely contrast between marble and wooden steps. The colour mingle subtly and in a natural style. Marble is definitely an interesting material to use for a stairway, and in this particular house it contributes to its earthy character. In addition, it also provides a sense of opulence and luxury, as it is a coveted material which has not always been available to the masses. The light colour of the material allows for the space to expand, a effect amplified by the strategic perimeter lighting. At night we get a very romantic view of this house. At the back we can see the open side of the new modern structure. Here at the back the length of the wall is almost entirely constituted of windows and sliding doors. This opens up the home to the outside much more than the front of the house does. It allows for natural light to flood the rooms during the day and the regulation of temperature. With the soft, warm light used in the interior of the rooms in this part of the house creates a pleasant and romantic atmosphere and a lovely sight from the outside. We can also see here the excellent view of the town the house has access to. We end this tour off with a beautiful view of the town from a greened terrace. This terrace is found above the driveway and the first floor balcony—it is a third tier. It is a small space found between the exterior boundaries of the property and the walls of the house. The architects decided not to let any space go to waste, and installed a small lawn for relaxation and recreation. This is the ideal spot to spend lazy afternoons gazing at the sky and town, or to enjoy intimate summer evenings with close friends. It seems that this house offers several such functional and beautiful spaces to be used in several ways and to be enjoyed purely for its aesthetic. 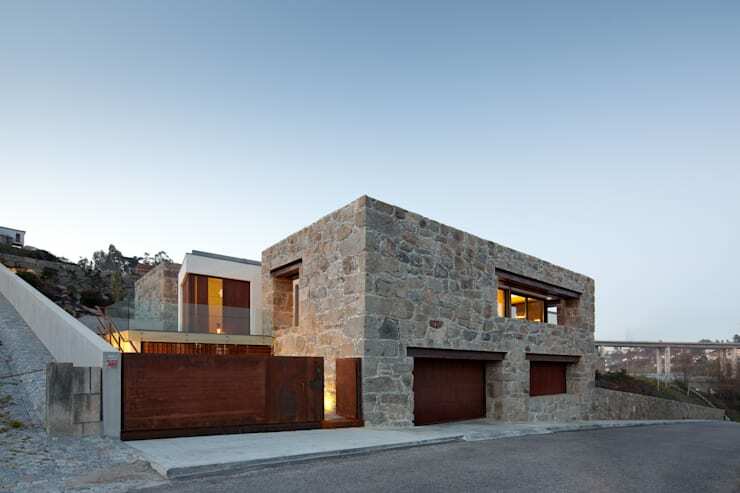 The project had certainly succeeded in merging the historic with the modern in an exceptional manner. For another transformation of a historic home, take a look at: A Nostalgic Villa Full Of Charm. What is you favourite aspect of this historic and modern home? Let us know in the comments!